Takaratomy Masterpiece series is among the best Transformers line in the world and the much anticipated figure of all time, the Soundwave is finally making his way into this line! Toy Garden and Toywiz Malaysia will be taking preorder for this figure as he is coming our way on Dec 2012! Counted among Megatron’s earliest followers, Soundwave perpetuates his role as Decepticon communication specialist by virtue of Mini-Cons which stealthily infiltrate the fortifications of Autobots and Decepticons alike, enabling Soundwave to provide Megatron with even the most secret or obscure information. Soundwave’s sensors are sensitive to even the lowest radio transmissions, and his penchant for monitoring electrical brain impulses provides him with the equivalent of telepathy. Soundwave’s predilections make him unpopular among his fellow Decepticons, mostly limiting his interactions to the company of his Cassette Warriors. Though he is sometimes portrayed as an arbitrator, Soundwave is hypervigilant of any potential rival in the Decepticon hierarchy, and will use blackmail to eliminate any such rival as quickly and as thoroughly possible. 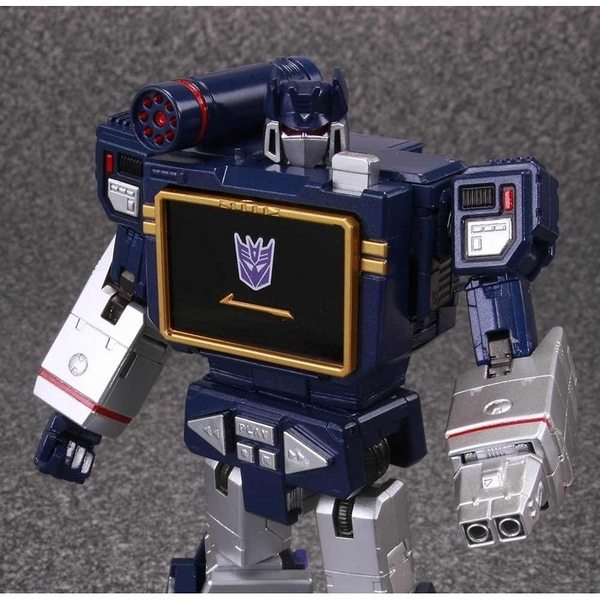 Masterpiece Soundwave will come with a miniature Megatron in gun mode for additional firepower, and additional cassette the Laserbeak as well! how do i pre order …? Hi, How to pre order?